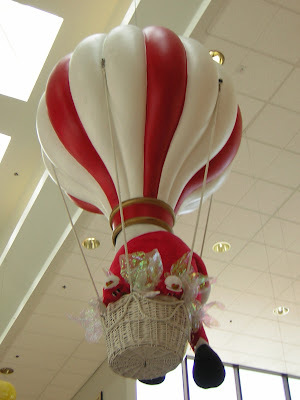 The theme for this month's Cupcake Hero is Earth Day! This being Earth Day, I'm doing my post today...so Happy Earth Day and enjoy these cupcakes! I found a terrific recipe for lemon cupcakes in The Great American Bake Sale. I bought this collection of recipes a while back but never managed to bake anything from it. The original recipe is "That Baltimore Cake" from Ann Amernick, and I modified it somewhat but it still ended up really delicious! Very lemon-y with lemon in the cupcakes, the "lemon soak", and the frosting, but not at all overpowering. I do recommend using a relatively thin layer of frosting because it is pretty intense. 1. Preheat oven to 350 degrees. Line cupcake pans with cupcake papers. 2. For the cake, sift together flour, salt and baking soda in a small bowl. 3. In a large bowl, cream together butter and sugar on medium speed for 2 minutes, until light and fluffy. Add eggs one at a time, beating very well after each addition. Add lemon zest and mix to incorporate. On low speed, add flour in 3 additions and sour cream in 2 additions, alternating between the two. Add milk and lemon extract, and mix for less than a minute until batter is just smooth. 4. Spoon batter into baking cups and bake 15ish minutes until the cupcakes are risen and golden brown, and a toothpick comes out clean. 5. While the cakes are baking, mix together the lemon juice and sugar for the lemon soak. Don't worry about making sure all the sugar gets dissolved. 6. As soon as the cakes come out of the oven, poke the top with a toothpick a few times and spoon lemon soak over the top. Le cool completely. 7. Make the lemon frosting. Beat the butter until fluffy and then beat in the lemon juice and a bit of lemon extract if using. Beat in powdered sugar until the frosting tastes as sweet as you want it to...I went for a more sour frosting but your mileage may vary. When the cupcakes are cool, frost and enjoy! My friend Nina and I took a drive up to the Jelly Belly factory in Fairfield, CA last week because we needed a break from school and are both in love with Jelly Bellies (Bellys?). What a great tour! 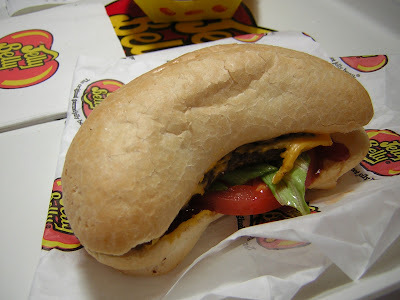 First we had lunch at their cafeteria, where we both had jelly bean-shaped hamburgers (how cute!). The tour was fantastic--it's long and you really get to see a lot of the process. 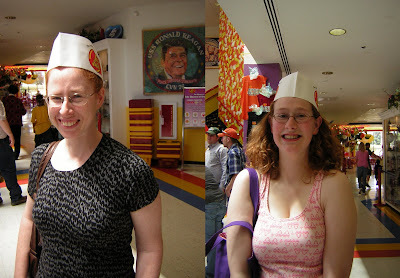 You get to wear funny paper hats but sadly you can't take pictures in the factory. 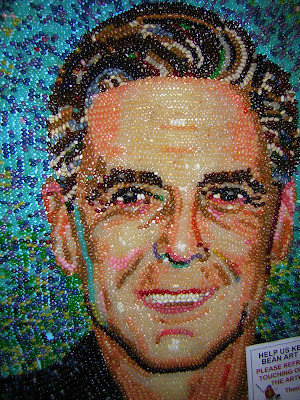 Then, after that we got to try a few beans at the "tasting bar" and we both filled large bags full of jelly beans to take home. It was so exciting to be able to choose from all the different flavors they make! My favorite new (to me) ones were wild blackberry, pomegranate, and kiwi. And of course, I was happy to see some old favorites, orange juice, crushed pineapple, and peach. All in all, a really fun time...I would highly recommend it if you're in the area! We got some great, 80-degree days this past weekend. Housemate Josh and I had some friends over for grilling (more on this in a later post). 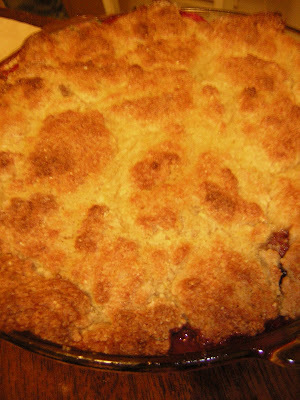 I made rhubarb-strawberry cobbler for dessert, using a recipe from epicurious. Despite it being pretty brown on top, I think I pulled it out of the oven too soon. I actually preferred the leftovers, re-cooked in a 400 degree oven for about 15 minutes. I would make this again, but cover it with tin foil toward the end and cook it maybe fifteen minutes longer. 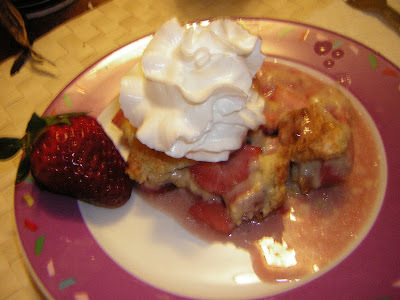 Strawberry-Rhubarb Cobbler -- recipe is here. This is a fairly quick, yummy soup with unusual flavors. I liked that it doesn't taste much like other types of soup I make, but it was still delicious! I made this with my housemate Jessie, who also made a terrific Greek salad to go on the side. Check out other yummy and healthy veggie foods at Sweetnick's ARF/5-a-day roundup. 1. In a saucepan, bring stock to a simmer. Meanwhile, saute the onions and garlic in oil for about 8 minutes, until soft. Stir in the turmeric and paprika, and saute for one minute. 2. Mince the rosemary and sage. Add the herbs, potatoes, and stock to the onions and garlic. Cook 12 minutes until potatoes are tender. 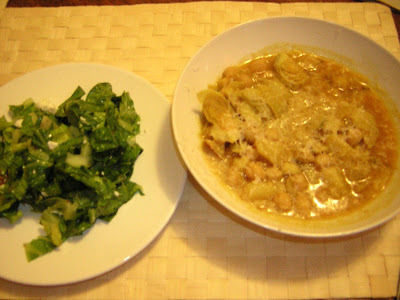 Stir in pureed squash and add the chickpeas and artichoke hearts. Salt and pepper to taste and return to a simmer. 3. Serve with lemon wedges and top with grated Parmesan, if you wish. Ah, the joys of homemade pizza! This pizza dough recipe from Martha Stewart is so, so easy--you just pop everything in the food processor, pulse a few times, and it just comes together. It barely even needs to be kneaded! Then you're ready to top it with whatever you want. We covered the whole thing in pepperoni and mozzarella cheese, then added roughly chopped artichoke hearts to half and pineapple to the other half. Although the recipe says it makes 2 12-inch pizzas, we made one big pizza of indeterminate diameter (my housemate Kristi has a really neat pizza pan with holes in the bottom to help the crust get really crisp). The pizza tasted fabulous and was definitely worth the little bit of extra effort from just picking up the phone! 1. In a small bowl, sprinkle sugar and yeast over warm water. Stir with a fork until yeast and sugar dissolve. Let stand until foamy, 5 minutes. 2. In a food processor, pulse flour and table salt to combine. Add yeast mixture and oil, pulse until mixture comes together but is still slightly tacky. Dough should pull away cleanly from your fingers after it's squeezed. Turn out onto a lightly floured surface and knead four or five times until a smooth ball forms. 3. Place dough in a lightly oiled bowl, smooth side up. Cover with plastic wrap and let rise in a warm place until doubled in bulk, 40 minutes. 4. Punch down dough. Fold back on itself four or five times, then turn smooth side up. Replace plastic wrap and let rise again until doubled, 30-40 minutes. 5. Punch down dough. Turn out onto a lightly floured work surface. If making two pizzas, divide dough into two and knead each piece 4-5 times, then form a smooth ball. Return one ball to the oiled bowl; cover with plastic wrap. Pat the remaining ball into a flattened disk; cover with plastic wrap and let rest 5 minutes. Stretch dough into desired position, then place on pizza pan, wooden peel, or baking sheet that has been oiled or dusted with cornmeal. 6. Preheat oven to 450 degrees and place pizza stone in oven if using. Spread a thin layer of pizza sauce on the dough, leaving a 1-inch border uncovered. 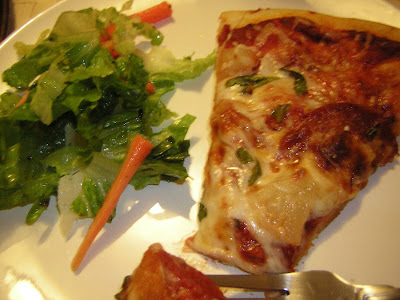 Arrange toppings on sauce (we used mozzarella cheese, pepperoni, artichoke hearts, pineapple and fresh basil). 7. 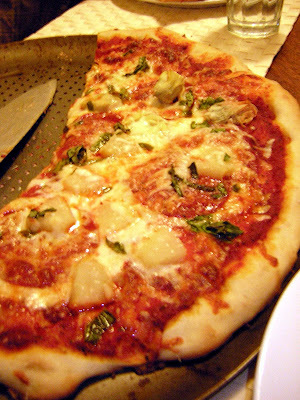 Slide pizza onto baking stone or place pan in oven. Bake until cheese is melted and crust is crisp and golden brown (12-15 minutes). Meanwhile, fix up the second pizza if making two pizzas, and bake after the first pizza comes out of the oven. 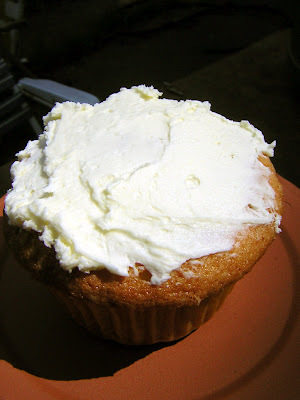 My housemate Jessie found this amazing recipe on How to Eat a Cupcake. 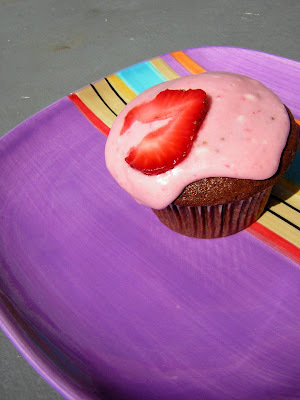 Neapolitan cupcakes--wowsers! I knew I had to make them. My friend Melissa and I had been planning a baking afternoon, and this seemed like the perfect recipe for it since it involves two batters. She made chocolate, I made vanilla, and then we combined them for the final cupcakes. 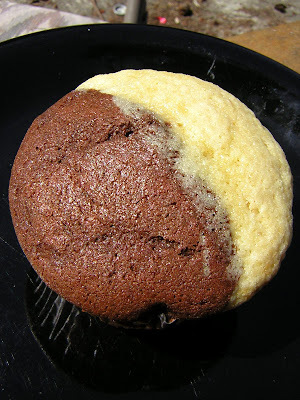 Because both batters are on the thick side, it's easier than you might think to fill half the cupcake wrapper with one and half the cupcake wrapper with the other. I used How to Eat a Cupcake's recipe for the cupcakes, and then used my own recipe for the frosting. It's just getting to be strawberry season here, so I wanted something that used fresh strawberries. I also wanted to incorporate strawberries and cream cheese, since I think that's a lovely flavor combo. Mine didn't turn out quite as pretty as the originals, but they were really yummy! 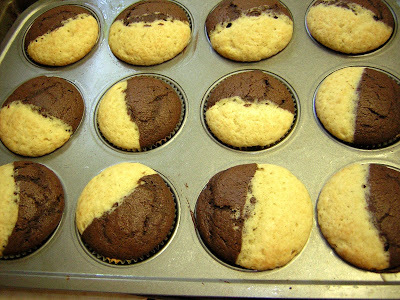 Prepare both vanilla and chocolate batters; fill cupcake wrappers with 3 tablespoons of each, side by side. Makes 24. Repeat same ingredients above, but reduce flour to 1 1/4 cups, and add 1/2 cup unsweetened cocoa powder. Whisk into dry ingredients. 1. Preheat oven to 350 degrees. In a medium bowl, whisk together flour, baking powder, and salt; set aside. 2. With an electric mixer, beat butter and sugar until light and fluffy. Add eggs one at a time, beating well after each addition; add vanilla, and mix until combined. On low speed, beat in half the flour mixture, followed by milk; end with remaining flour mixture. Mix just until incorporated (do not overmix). 3. Fill muffin cups with 3 tablespoons of each batter, side by side.. Bake until a toothpick inserted in center of a cupcake comes out clean, 22 to 24 minutes. 1. Hull strawberries and then slice them into large chunks. Pulse strawberries in the food processor until pureed. Force through a strainer into a small bowl. 2. With an electric mixer, beat the butter and cream cheese until fluffy. Add most of the strawberry puree and beat. Add powdered sugar until frosting is desired sweetness and consistency. Taste for whether to add more cream cheese/puree/sugar along the way. 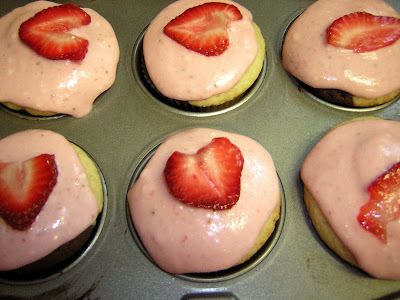 Ice cooled cupcakes and top with a slice of strawberry. 3. I found that the icing got as sweet as I wanted it before it got thick enough...I wasn't sure how to fix this, so I just drizzled on the somewhat-too-thin icing. Although it wasn't as pretty, it sure did taste good! 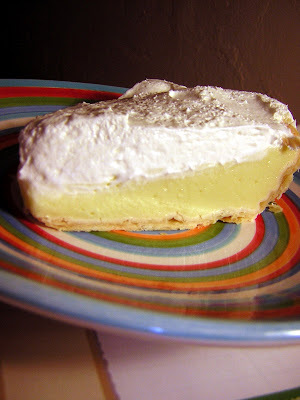 This cream pie was more successful, though I actually made it first. Nice, subtle coconut flavor and yummy cream on top. I think the only change I would make next time would be to use a graham cracker crust. 1. Prepare an ice bath; set aside. In a bowl, lightly whisk egg yolks; set aside. In a saucepan, whisk together coconut milk, granulated sugar, cornstarch, and salt. Bring to a simmer (do not boil), and cook, whisking constantly, 3 to 4 minutes. 3. Melt chocolate in the top of a double boiler or a heatproof bowl set over a pan of simmering water (do not let bowl touch the water), or in the microwave. Stir until smooth, and set aside until cool to touch, stirring occasionally. 4. Using a pastry brush, coat inside of cooled crust with melted chocolate. Place in refrigerator or freezer until firm to touch, about 10 minutes. 5. Fill crust with coconut custard, spreading evenly with an offset spatula. In the bowl of an electric mixer fitted with whisk attachment, combine cream and confectioners’ sugar; beat until soft peaks form. Using a small offset spatula, spread whipped cream on top of custard. Refrigerate pie at least 3 hours before serving. At home over break, my mom and I wanted to make a Butterscotch Cream Pie. I had just made a Coconut Cream Pie (more on this in a later post), but everyone still wanted a cream pie and we thought this would be a yummy alternative. Doesn't it sound delicious...buttery crust, creamy butterscotch pudding filling, and whipped cream on top? In the heat of the moment, we ended up using the first recipe off of Google (http://southernfood.about.com/od/creampies/r/bl30109s.htm). My mom liked the end result well enough but I wasn't a huge fan of the flavor of the filling, which felt kind of harsh/bitter. This may have been the recipe or it may have been our failure to caramelize the sugar properly, or a combination of both. 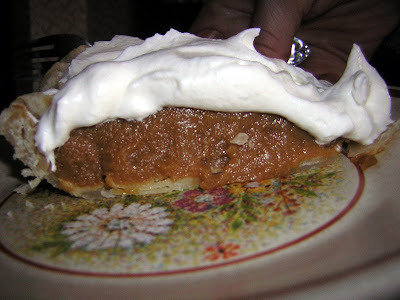 If anyone has a tried and true recipe for Butterscotch Cream Pie, I'd love to try again sometime! This may just be my new favorite chocolate chip cookie recipe. 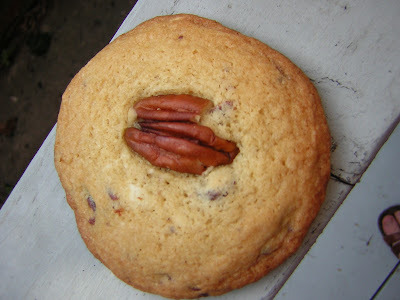 Jennifer posted the recipe over at Bake or Break and the cookies are simply scrumptious! Her recipe is copied below (from Great Cookies by Carole Walter) but you should also check out her pictures which are much prettier than mine! I've made these a couple of times, always with good-quality white chocolate as one of the options and other random chocolate (semi/bitter/milk/etc.) as the other options. If you like white chocolate, I highly recommend using Green & Black's in this as it's my very favorite (and if you don't, it might just convert you!). You can chop the chocolate bigger or smaller depending on your preference...the last batch I made, I chopped the chocolate very small and the cookies look like dalmatians! Mix together flour, baking soda, baking powder, and salt. Set aside. Gradually add dry ingredients. Stir in chocolates. Bake for 8-10 minutes, or until tops are just set and the edges are lightly browned. Cool cookies for 4-5 minutes, then transfer to wire racks to cool completely.